As I wrote in summer, there's something about Dobra. The klimat immediately triggered flashbacks, familiar feelings of somewhere I knew well but where I've never been. 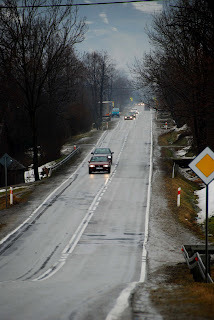 The Droga Krakowa (national road) 28 gave me that feeling very strongly, whether walking along it or listening to the occasional vehicle on it as I lay awake in our guest house. Right: DK28 running through Dobra, looking east.